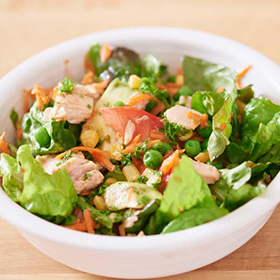 Divide and arrange 2 cups of salad ingredients in each of 4 serving bowls. For dressing, combine all ingredients and mix well. Spoon 2 tablespoons over each salad, and serve. Serving size: 2 cups salad, 2 tablespoons dressing. Amount per serving: 224 calories, 9g total fat (1g saturated fat), 24g carbohydrates, 15g protein, 6g total fiber, 264mg sodium.